Stumbling Upon Miniature Memorials To Victims Of Nazis A German artist has found a way to remember individuals who perished in the Holocaust. He is laying brass bricks — each bearing the name of a victim — in sidewalks across the country. Each of these privately funded "stumbling stones" lies outside the last known place where the victim freely lived. 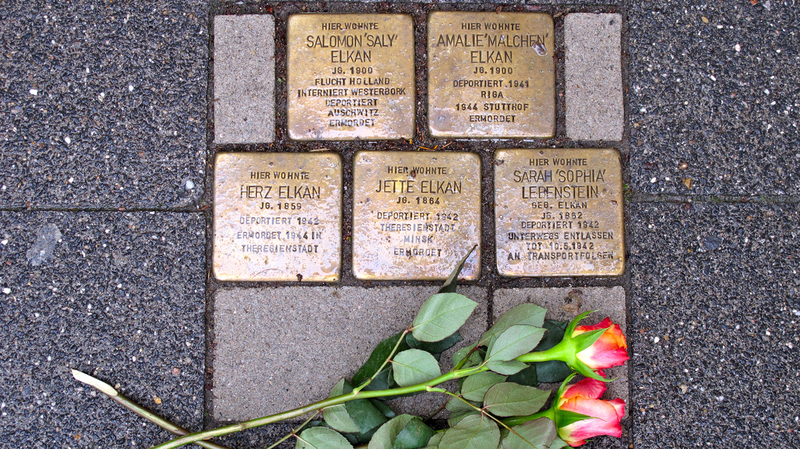 Brass bricks known as Stolperstein, or "stumbling stones," in front of a home in Raesfeld, Germany, where five members of a single family were forcibly removed by the Nazis. Across Germany, the stones commemorate the millions of victims of the Nazi regime. "Today we are laying 45 stones for Jewish victims that lived in these houses," Demnig says as he secures the brass brick for Martin Lwowski, a former resident deported in 1943 and murdered at Auschwitz. Wearing a cowboy hat and denim from head to toe, Demnig is watched by a quiet throng, many dressed in their Sunday, or Sabbath, best, out of respect for the dead. 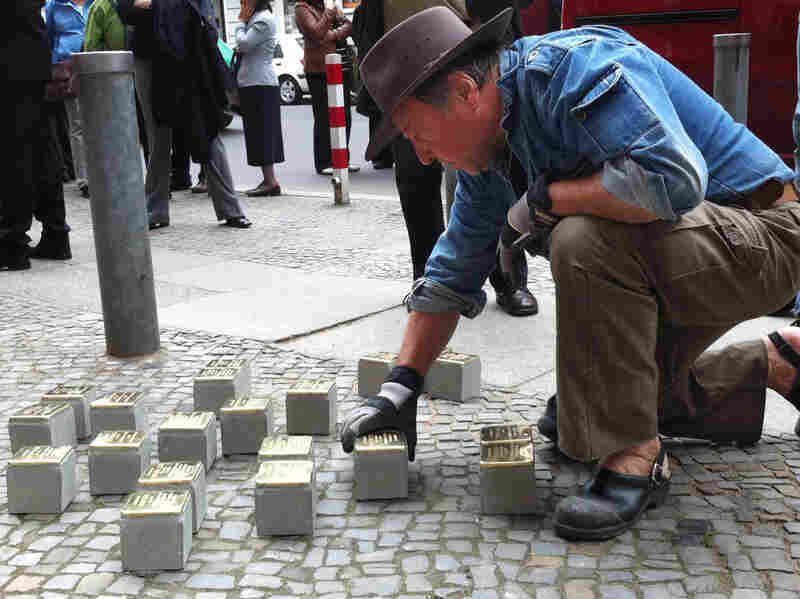 He first got the idea for the Stolperstein, or "stumbling stones," as part of an art project back in the mid-1990s when he installed 55 such commemorative stones in Berlin sidewalks. Guenther Demnig is the artist and sculptor behind the stumbling stones. Here, he installs new bricks in Berlin. He says formal memorials are too abstract. Not so with the stumbling stones. "Suddenly they are there, right outside your front door, at your feet, in front of you," he says. In the ensuing years, the project has mushroomed. Now, there are more than 30,000 commemorative bricks in dozens of cities and towns across Germany. Demnig relies on local residents and schools, as well as religious and secular groups, to research the victims, their last address and where they were killed. He then makes and installs the bricks with help from two apprentices. This kind of memorial is more personal, he says, because it commemorates where the terror began, likely with a Gestapo or SS raid on a victim's apartment. Germans have long anguished over and debated how to best memorialize victims of the Nazi regime: millions of European Jews murdered in the Holocaust as well as political opponents, homosexuals, Roma and disabled people. There are museums and some big memorials, but to Demnig and many others, those are hardly adequate. "I think the large Holocaust memorial here [in Berlin] will always remain abstract. You have to make the decision to visit it," Demnig says. "But not with the stumbling blocks. Suddenly they are there, right outside your front door, at your feet, in front of you." These latest bricks, which are always privately funded, were organized by 52-year-old Hendrik Czeczatka, who spent part of his childhood in an apartment building on Pestalozzi Strasse where his grandmother lived. "I grew up right here. I played football in this courtyard. I broke that window right there," Czeczatka says, pointing, "much to the dismay of my grandmother." Just off the street in the courtyard of a 19th century tenement housing block is a synagogue, built in 1918. It survived the Kristallnacht attacks in November 1938, during which Germans torched and ransacked Jewish homes, stores and synagogues. Czeczatka remembers his grandmother telling him how she instructed the Nazis not to burn the synagogue because Aryans lived in the surrounding apartments. After Czeczatka moved into the family apartment about 15 years ago, he began to research just who lived in his building. He found names of more than 40 Jewish residents who were rounded up and deported to death camps, mostly Theresienstadt. Before 1933, Charlottenburg had the largest Jewish population in Berlin. Yet Czeczatka was alarmed that so few households in the area had bothered to request Demnig's bricks. So he started raising money and awareness. "Everybody in the first place is responsible, individually, for remembering. One can't pass off everything to the state. And we are the state anyway," Czeczatka says. "All of us must continue to insist that Nazis are not welcome, that we must keep the memory alive and learn from our history so that it does not happen again." All of us must continue to insist that Nazis are not welcome, that we must keep the memory alive and learn from our history so that it does not happen again. One of the onlookers at the informal, yet emotionally charged and police-protected bricklaying ceremony is Lala Suesskind, former chairman of the synagogue's committee. Suesskind has come to meet Czeczatka and shake his hand. "That this is the initiative of a non-Jewish resident and his wife really moves me," Suesskind says. The brick project has its critics. Some homeowners elsewhere have complained quietly that having quasi-tombstones in the sidewalk outside is bad for property values and business. But the main complaints are that the bricks only highlight victimhood, and that when people, dogs and bikes trample over the names of the dead, some argue, they are victimized a second time. In Munich, city officials and a large influential Jewish group rejected the project. In fact, they banned the bricks after arguing that they desecrated the memory of the victims. But Helmut Loelhoeffel, coordinator of the Charlottenburg Stumbling Block Initiative, believes those criticisms are misplaced. "Six million Jews were killed, murdered. The stumbling blocks make clear that it was one plus one plus one plus one," Loelhoeffel says. "It makes clear that they were all individuals."